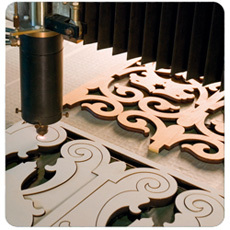 The company has always been very attentive to the technology evolution and to its possible uses in the field and it has been one of the first users of the laser technology for the inlay working marquetry. In 1989, Mr. Parisato presented and obtained the international patent for the use of the laser ray as processing technique of wooden inlays. Following the trace of a geometric shape, electronically drawn and memorized by a specific device of processing control, it is possible to obtain inlays that are industrially reproducible to the finest detail, with considerable savings in terms of waste material.